At Delivery Biz Pro, we provide home delivery software for brand new businesses as well as businesses that have been around for decades. Each business that we serve has unique needs, and we have made our software customizable to meet those needs head-on. Before you decide to start your delivery, you will want to ensure that there are people in the area who will actually use it. Put out some feelers at community events, farmers markets, and neighborhood forums to discover if people will buy what you’re selling not only in terms of your product but your service as well. If your market is heavily saturated with competitors, it might be hard to find solid footing at the beginning. Do plenty of research about your competitors and find out what you will need to do to compete. What will your edge be that convinces customers to choose you, and brand new business, over an established competitor? While creating a delivery radius might narrow your scope of customers, it will also ensure you aren’t going overboard on mileage costs. You can always expand this radius later as you find success. It might be a good idea to start in a heavily populated area and expand to homes that are further off the grid at a later time. This one seems obvious, but many entrepreneurs start with a product before they have a way to deliver it. 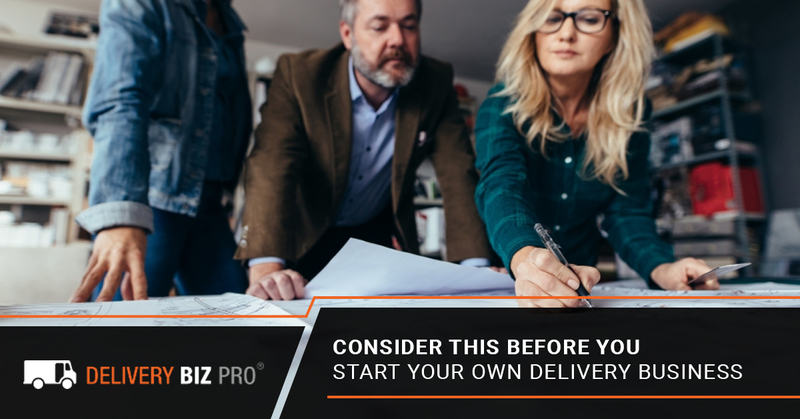 The ins and outs of the delivery business can be complicated and starting off on the right foot is a vital step toward success. Utilizing a home delivery software from the beginning can help you ensure quality service on your very first day. Learn more about our home delivery software! What will you need to deliver your promised products? You obviously need access to your product, whether it is fresh milk that you personally collect on your dairy farm every morning or propane that is shipped in from a supplier. But you also need tanks to hold the propane, bottles to hold the milk, or ice boxes to keep meat cold. You also need a way to transport orders, whether it is a van, a truck, or a trailer. If you own a business but nobody can find it, it won’t be successful. Devise a marketing strategy whether it is posting flyers at grocery stores, going door to door, or running Facebook ads. Make sure people will know how to find your website and how to place orders. When you work with our home delivery software company, we can help you create promotional materials like postcards and door hangers in addition to the other features our software includes. While it can be tempting to go “all in” on your new business, it is important to start small and ensure you can feasibly handle and afford running your business. After you master a small region or offering only a few products, you can expand your inventory and delivery radius. Do plenty of research to make sure that your business is legal and that you have the proper licensing and insurance. This is especially true if you will be providing food products. Each state and city have their own laws, so check to ensure you are meeting your local regulations. In this day and age, it is nearly impossible to run a successful delivery business without an intuitive home delivery software. The Delivery Biz Pro software can be specifically tailored to your industry and seamlessly integrates everything from your website to your customer database to order management to route planning. Everything’s made simple with just one software. Fill out our short delivery software application today to learn more!